Blood relation is usually asked in every competitive exam. 1-2 question is surely asked in SSC government job exams and 5-10 questions are asked in banking exams like IBPS, SBI, RBI etc. It follows few simple tricks which can be comprehend by anyone and solves the question correctly. In English language, all relations are defined in simple way and totally different from Indian culture. Here, you can take note of it. If you read these questions in Hindi, you can easily visualise the blood relation and answer the questions. As, in Indian culture all relations have specific name. That's why I will be using Hindi at different places to clarify blood relations questions accurately. Let’s take an example to understand what trick can be followed. 1. Pointing a photograph X said to his friend Y, "She is the only daughter of the father of my sister’s only brother" How X is related to the person of photograph? I. Start from last word in the statement under inverted commas. It means- ‘my sister’s brother’ which means- मेरे बेहन का भाई… जो की वह खुद हुआ… because ‘only’ is also used in the statement. III. Now, ‘only daughter’ means- उसके पिता की बेटी, जो की उसकी बेहन लगी. IV. Hence, answer is X is the brother and person to whom he is pointing in the picture is his sister. 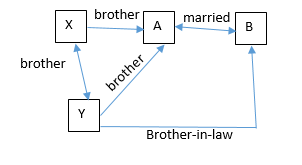 Here, you have to tell – ‘how X is related to the person’ this means X is the brother of the person in the picture. V. Brother in the option of the question will be answer. It derives that the person in the picture is his sister and X is the brother. 2. X introduces Y saying “He is the husband of the grand-daughter of the father of my father”. How Y is related to X? 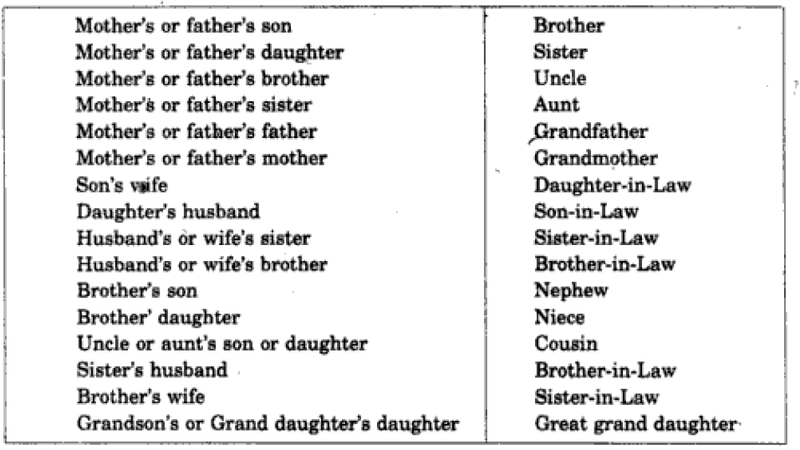 Note: X is not defined in the question whether it is sister or brother. But, in relation it is clear that X is introducing his/her Brother-in-law. Hence, Y is the brother-in-law of X. 3. Pointing to a girl in the photograph, Amar said “her mother’s brother is the only son of my mother’s father”. How the girl is related to Amar? Here, you can start from the last words of the statement. IV. Here, uncle is same for both girl and Amar. That means, Amar is the brother/cousin of the girl in photograph. Answer -> the girl is Sister/Cousin (if mother is not same) of Amar. 4. A man pointing to a photograph says “the lady in the photograph is my nephew’s maternal grandmother” How is the lady in the photograph related to the man’s sister assuming man has only one sister? 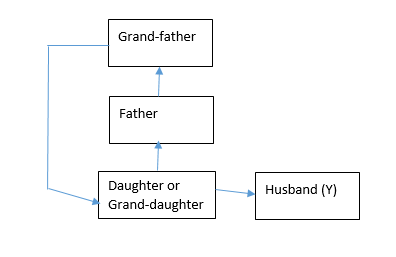 In this, you can also start in horizontal flowchart to figure the blood relation in the given question. Hence, lady in the photograph is Mother to Man’s sister. 5. Pointing to an old man, Nitin said “his son is my son’s uncle” How the old man is related to Nitin? In this, you can solve by converting question in your language. It will look simple and easy. II. Means the old man must be uncle or father of Nitin. The answer will according to the option. If Father or Uncle is mentioned, choose the appropriate one. 6. A and B are married couple. X and Y are brothers. X is the brother of A. How is Y related to B? This is the way to solve these types of questions by placing different at different places so that one can easily figure out each relation with one another. Comments "Blood relation notes and tricks for SSC and IBPS exams"